RecoverM8 - Recover AutoCAD drawing files, great for making sure that drawings are in pristine condition before they are archived. System requirements: Runs inside AutoCAD versions 2000 through 2017. RecoverM8 was developed out of a need to re-archive thousands of old drawings that were being stored on old 3 1/2" floppy diskettes. Many of these archives had been stored on this media for 15 years and magnetic media is usually only good for 10 years. Out of 1200 diskettes only three were unreadable and unrecoverable. RecoverM8 will let the user select drawing files using one of three different methods: Multiple manual selection, All drawings in a selected folder and All drawings in a selected folder and all sub folders. 1st seat license is U.S.$50.00. 2nd through 10th seat will be an additional U.S.$25.00 each. 11 or more seats are an additional U.S.$15.00 each. o register: Select the number of seats you wish to license then pick the PayPal buy now button, you will then be redirected to the PayPal site for payment processing. RecoverM8 requires that AutoCAD run in single document mode. RecoverM8 will only work if AutoCAD is in Single Document Mode. AutoCAD has a system variable called SDI that controls this. 0 = Multi Document Mode. 1 = Single Document Mode. Picking Yes will switch AutoCAD into Single Document mode and bring up the main RecoverM8 dialog box. Picking No will exit RecoverM8. If you have more than 1 drawing open and launch RecoverM8, you will be notified that you need to close the drawings and have only a single drawing open. 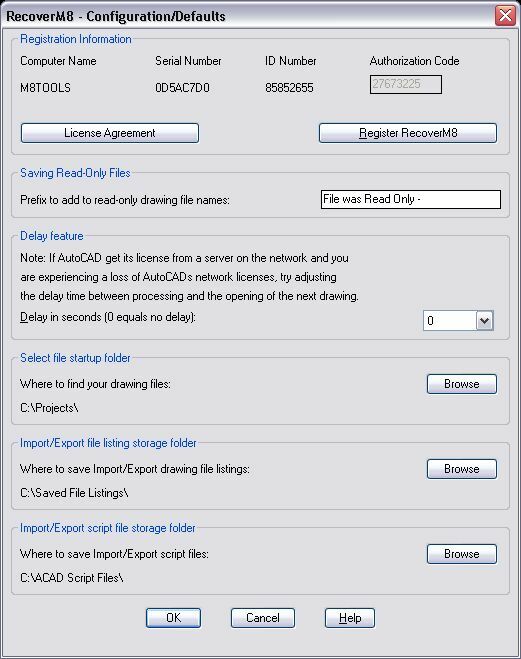 RecoverM8 was created to allow AutoCAD users the ability to select multiple drawing files (*.dwg) and run AutoCAD's recover command on them. 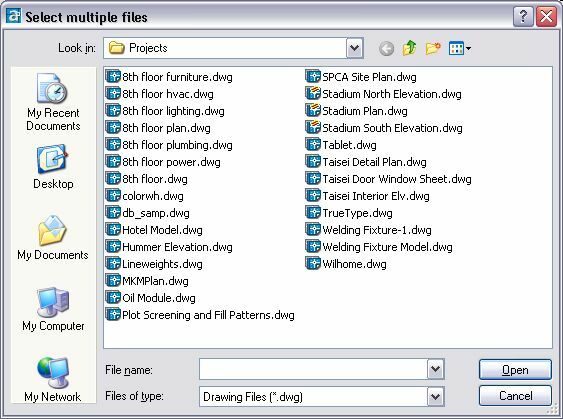 Drawing File Selection Method - User has three choices of drawing file selection. a) Manual - This opens up a multi-file selection dialog box. b) All files in folder - Brings up a folder selection dialog box, user selects a folder and all the files in this folder will be selected. 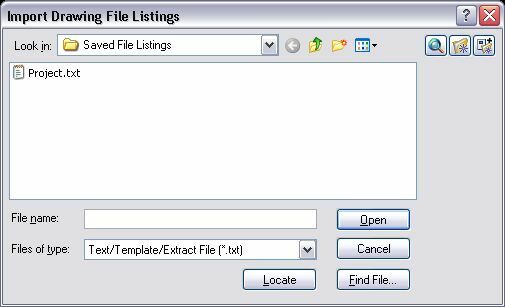 c) All files in folder and all sub-folders - Brings up a folder selection dialog box, user selects a folder and all the files in this folder and all folders beneath this folder will be selected. 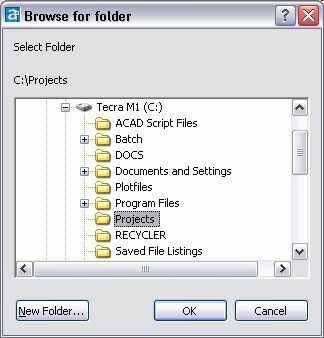 Select Files - Brings up what ever file or folder selection method is selected in the Drawing File Selection Method. Import File List - This button loads a saved drawing file selection set. Export File List - This button saves a drawing file selection set for re-use. Sort File List - This button sorts the current drawing file listings. 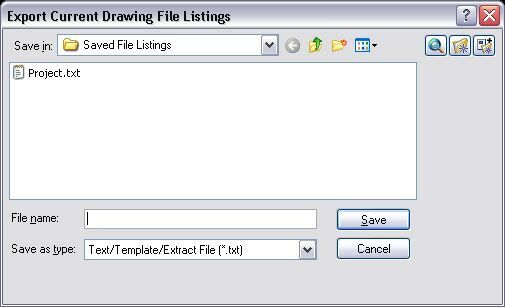 Drawing File List - This list box shows drawing files that have been either selected or imported. Once files are listed, you can select one and either move it up or down or delete it from the list. Move Up - Moves a selected drawing file up the selection set. Move Down - Moves a selected drawing file down the selection set. Delete Item - Removes a selected drawing file from the selection set list only, does not actually delete the file. Commands - Once each drawing has been recovered you have the option to run commands on those drawings. After recovery, save each drawing as - Once each drawing has been recovered you have the option to save as the current AutoCAD version or a prior version that is supported by your AutoCAD version. Config - This button opens the configuration dialog box. The user enters registration code and default settings. OK - Once drawing files are selected or imported, this button becomes active and when picked, starts recovering the drawing files. Pick Yes to pick up where RecoverM8 left off. Pick No to open RecoverM8's main dialog box. Cancel - Cancels RecoverM8 and returns the user to the AutoCAD command line. Help - Brings up this on-line help. Info - Displays RecoverM8 information. The Manual Selection files dialog box allows the user to select multiple drawing files to recover. Users can step through drives and directories as needed. (Note: Only current display of files can be selected. To select multiple files from different directories, just pick the Select Files button from the main RecoverM8 dialog box.) Once files are selected, pick the Open button. This will take the you back to the main RecoverM8 dialog box. The selected files will appear in the main RecoverM8 dialog box. The All Files in Folder dialog box allows the user to select all the drawing files that reside in the folder to recover. The All Files in Folder and All Sub-Folders dialog box lets the user select all drawing in all folders from the selected folder to all sub-folders. The users can select the files they need to recover by picking the folder that they reside in. User can also step through drives and directories as needed. (Note: Only one folder can be selected. To select multiple folders just pick the Select Files button from the main RecoverM8 dialog box while either folder selection mode is active.) Once a folder is selected, pick the OK button. This will take the you back to the main RecoverM8 dialog box. Pick the Open button. This will import the drawing file names contained in the text file. It will also check to see the file exist before adding it to the drawing file listing in the main dialog box. If a file does not exist, a message will pop up alerting the user the file does not exist. Once importing is complete, you will be returned to the main RecoverM8 dialog box. Pick or enter a file name to save the list of drawing file paths listed in the main dialog box. Pick the Save button to save the drawing file path listings to a file and return to the main RecoverM8 dialog box. Clear - Pick the Clear button to erase all entered commands appearing in the command list. Delete - Select a command then pick the Delete button to remove the command from the command list. Modify - Select a command then pick the Modify button to either change or correct an entry in the command list. 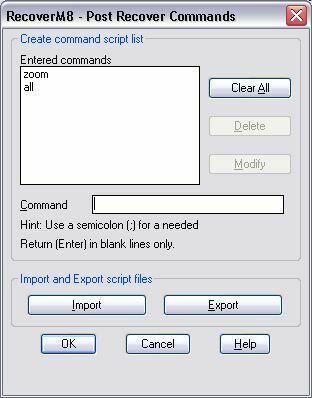 Import - Pick the Import button to select a script file to read into the command list. Export - Pick the Export option to write out the command list out to a user named script file. OK - Adds commands to file that get selected for Recovery. Selecting the Config button brings up a dialog box the user can use to setup operating features of RecoverM8. The Authorization code entry box - After you register RecoverM8, M8Tools.com will supply you with an unlock code. If an unlock code is not entered, the software will stop working approximately 10 days after installation. End User License Agreement - Will bring up a window that displays the Licensing Agreement. Register RecoverM8 - Will bring up the RecoverM8 Registration Form dialog box. Prefix to add to read-only drawing file names - If RecoverM8 processes a read-only file it needs to be able to save it. So if a file is read-only it will perform a saveas and add this prefix to the file name. Delay in seconds - If AutoCAD loses its license from a network server. This option will allow you to inserts a delay in the processing of drawings. The delay can be between zero (which disables the delay) to 59 seconds. This option might sometimes be needed on networks that experience heavy traffic (usage). Where to find your drawing files - If you have a default directory where all your drawing files or directories are kept, this would be the ideal location to have RecoverM8 start. Where to save Import/Export drawing file listings written to disk - Where you can store or retrieve text files that contain the location and file names of the drawing files written to disk. Where to save Import/Export script files written to disk - Where the user can store or retrieve command script files written to disk. OK - When the user picks OK, they return to the Main RecoverM8 dialog box. 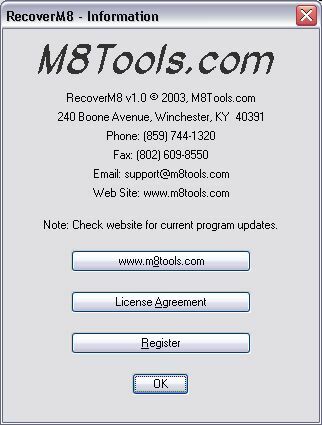 Web site link - Takes the user to M8Tools.com's RecoverM8 page. License Agreement - Brings up a window that displays the Licensing Agreement. Registration - Brings up the Registration dialog box. OK - When the user picks OK, they returns to the Main RecoverM8 dialog box. Selecting the Register RecoverM8 button from either the Config or Info dialog box brings up this RecoverM8 Registration Form dialog box. 1d) I just need to add the above Registration Info to the RecoverM8-Registration.txt file to be mailed later. If the user picks the first or second option, they need to fill out User Info fields. If the user wishes to register online, they can pick the third option. If a registration form has already been filled out, the user can append RecoverM8's Serial and ID Numbers from other computers to the end of the registration file "RECOVERM8-REG.TXT". Pick the number of seats you wish to register by picking the popup "Number of Seats". The total amount due will be displayed below the "Numbers of Seats" popup. If you are using the Internet to register, you will be directed to the PayPal web site for payment. You will then be directed to our online web registration page to complete the registration process. If you filled out the User Registration form, you will be asked to either accept the default file name or save the file "RECOVERM8-REG.TXT" to a desired location. Once this file is saved, it can be printed, emailed, mailed or have other Serial and ID numbers appended to it. When the user picks The Open button from the save file dialog box, the registration file will be saved. The user is returned to the Info or Config dialog box. Once the registration info has been filled in, the number of seats to register selected, all the Serial and ID numbers appended to it, it can be sent either by postal mail or email. Upon receipt of registration information and payment, M8Tools.com will generate the required unlock codes and forward them either by email or postal mail. U.S. and International Copyright Laws protect RecoverM8. By using, copying, transmitting, distributing or installing this software (RecoverM8), you (the user) agree to all of the terms of this License. 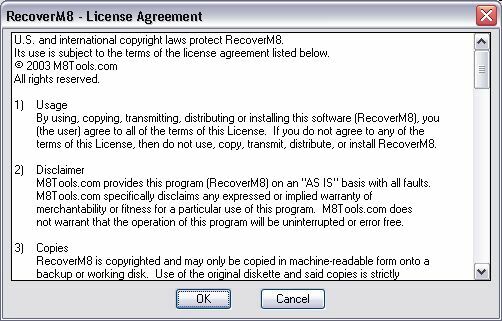 If you do not agree to any of the terms of this License, then do not use, copy, transmit, distribute, or install RecoverM8. M8Tools.com provides this program (RecoverM8) on an "AS IS" basis with all faults. M8Tools.com specifically disclaims any expressed or implied warranty of merchantability or fitness for a particular use of this program. M8Tools.com does not warrant that the operation of this program will be uninterrupted or error free. RecoverM8 is copyrighted and may only be copied in machine-readable form onto a backup or working disk. Use of the original diskette and said copies is strictly limited to a single computer system on which one or more users run RecoverM8. Copies of RecoverM8 may be shared with others as defined in the "Shareware - Software Sharing Method" described below, as long as all the source code and support files remain unmodified. 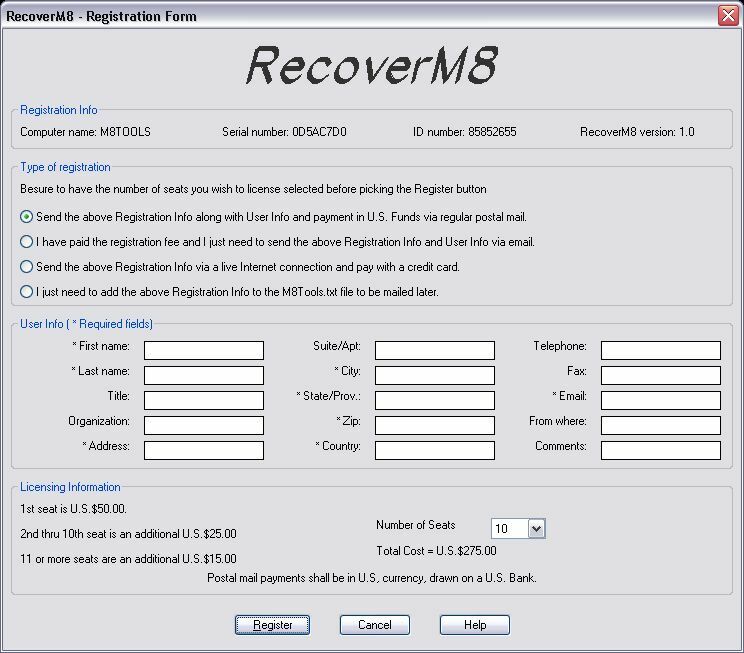 M8Tools.com will provide one free upgrade of RecoverM8, for all new registered users, when and if one becomes available. This Software requires an Authorization/Registration code. You must register this software product with M8Tools.com before an authorization code can be issued to you. Each installed copy is branded with a serial number that is unique only to the computer it is installed on. The serial number needs to be included with the registration of the software, so the author or a representative of M8Tools.com can supply an authorization code. The purpose of the authorization code is to protect the authors copyright and enforce the license agreement. If an authorization code is not obtained the software will stop working approximately 10 days after installation. Should the need ever arise to transfer RecoverM8 to another computer, a new authorization code will be needed. There will be one free transfer per year per seat license after an initial period of 90 days from the registration date. Should more than one transfer per year be required (per seat) a fee of U.S.$5.00 will be required for the generation of new authorization codes. By transferring licenses, the old serial number will become retired and thus inactive. If a user wishes to reinstall RecoverM8 on that computer they will need acquire a new license or retire another licensed copy of RecoverM8. If registered users wish to acquire new licenses, they can be purchased for the price entry point they last purchased the software. You are free to distribute the shareware version to others to try as long as all the source code and support files remain unmodified. This excludes the registration file (RECOVERM8-REG.TXT), which you are free to edit, so you may mail along with your registration fee, if you choose. You are free to try RecoverM8 for a period of ten (10) days. If you don't find it useful then remove RecoverM8 and all related support files from your system. OK - When the user picks OK, they will go back to the Main RecoverM8 dialog box. Benefits: No individual machine registration information (Computer Names, Serial Numbers, ID Numbers and Authorization Codes) is required to unlock our shareware software versions of AutoM8, LeaderM8, PlotM8 and RecoverM8. Pick here for more site license information.